PART II (JUNE) is all about Rankings. Below you will see an example of just how much I analyze each player. This is not even covering all the bases, with Marshawn, but you will learn a thing or two. 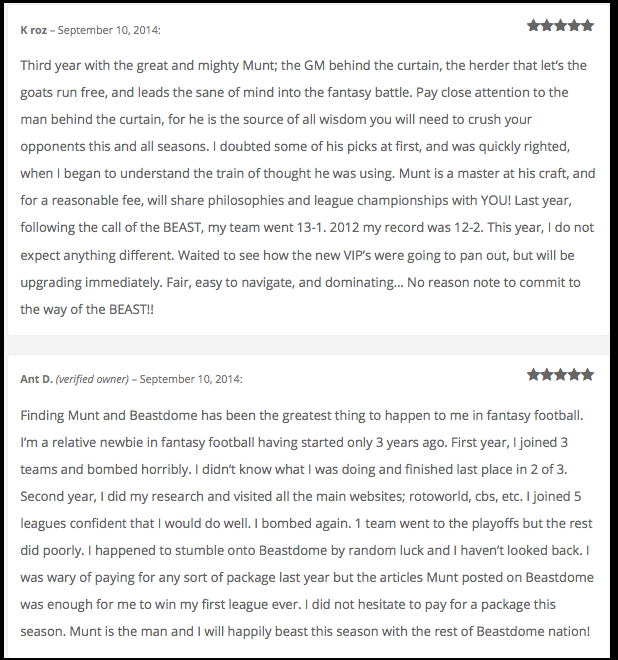 Once upon a time in 2014 every Fantasy Expert was ready to write off the 28 Year Old Marshawn Lynch for the up and coming Christine Michael. No you cannot make this up. Christine Michael was really hyped by other Fantasy Experts to take over for Marshawn Lynch. 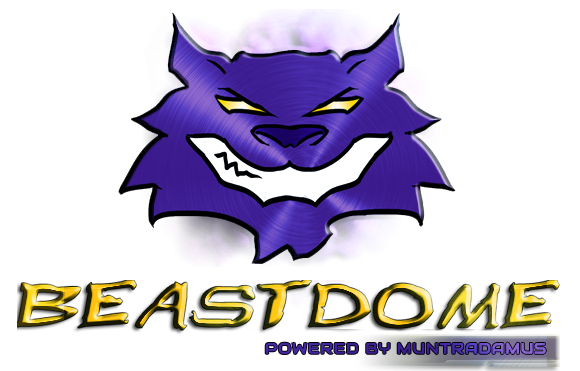 The BEAST DOME NATION stayed sharp, we snagged the BEAST in Round 2 that year, even though he was slipping to Round 3 in some drafts, while also grabbing Arian Foster. The outcome was 1673 Total Yards and 17 TD. I predicted 1650 and 18 TD in that article. After leaving the Seahawks for retirement in a very strange 2015 season where you can tell he was still clearly angry about the fact they did not give him the ball on the 1 yard line during the Super Bowl, what will be known as the worst play call in NFL History. Lynch played with half heart and emotion, got injured, and retired at the age of 29 with still plenty left in the tank based off what we saw in 2014. He wanted out of Seattle and he was going to handle it the way he wanted to. MARSHAWN LYNCH wants revenge! He knows that his career is about to take a climb that can not only make him the face of Las Vegas Football, but he can be in the Hall Of Fame if he finishes his career strong. The Oakland/Las Vegas Raiders is the perfect offense for Marshawn Lynch to be a BEAST and nothing but a BEAST. First the upside of sitting out a year. Marshawn Lynch was making deep playoff runs with the Seahawks 3 Straight Years. From that time he was seeing nearly 350+ touches a season, and a guy that runs as hard as Marshawn, that is a lot of hits to take. For Marshawn to sit out all of 2016 and play very light in 2015, should give Marshawn a much fresher body heading into 2017. If you think his age of 31 scares me, just know that these days in Pro Sports. Age is just a number, and unless you are going towards your 40s faster than you are going to 35, then you are just fine. Marshawn is really on a 1 year contract with $1.5 Million Guaranteed. If he is a BEAST, that money goes up, but $1.5 Million is not putting his body on the line for only $1.5 Million. Marshawn could have been making a lot more money in Seattle if he never retired. $12 Million/Year Guaranteed. 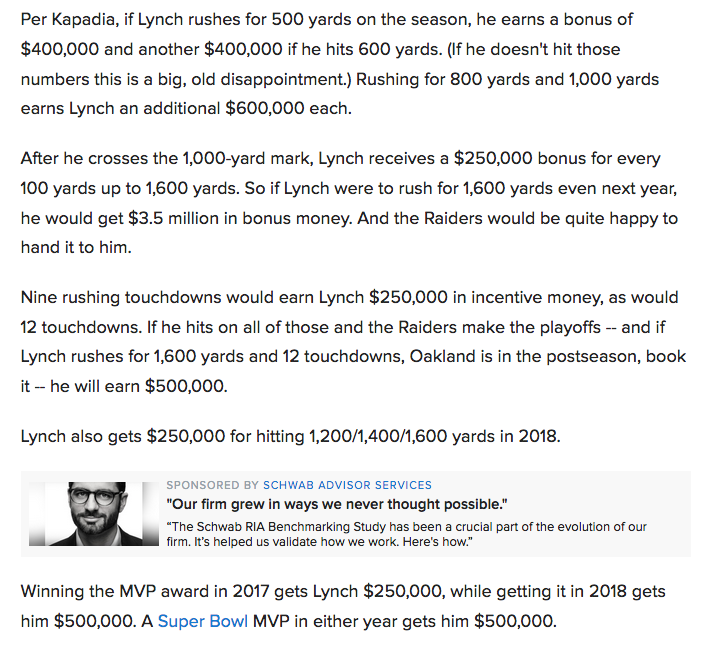 So while it is not about the money for Marshawn as it is about getting out of Seattle, it is still about the accomplishments to get his money. Both teams run two different systems to the MAX. However his last season in Seattle, the Seahawks completely re-worked their offensive line and there was definitely a growing process with them to start the 2015 season. The O-Line group was getting better as the season went on, emerging Thomas Rawls into Fantasy Stardorm for a minute. The O-Line still is below average compared to a majority of the NFL. They failed to keep Russell Wilson healthy from Week 1 of last season, and the rushing attack never blew teams away. The Raiders O-Line is one of the biggest and strongest in the NFL. The Offensive Line averages over 320 LBs and they have talent on that line that plays hard and strong. The Seahawks Ooffensive Line average above 300, but the Raiders have bigger bodies from left to right. Seahawks clearly built more for Russell Wilson, than Marshawn Lynch. The Raiders Passing Game can explode at any moment. Crabtree/Cooper on the outside is a combo that everyone knows is lethal. Defenses have to respect both of these players and more likely than not have a safety over the top. Seattle does not look to throw deep, they look to move the chains and control the clock. The Seahawks would love a drive where Russell Wilson has 2 First Down scrambles on 3rd down and they kick a long Haushka FG. They know their Defense will win the game for them, they just have to be consistent and move the ball. Raiders clearly built to score more points than the Seahawks. Thomas Rawls and his role was growing so much in 2015, by the time Marshawn Lynch came back the Seahawks did not want to stop running Rawls like a #1 RB. Marshawn was clearly unhappy and unmotivated. It is best for Marshawn that he moved on. Last year the Raiders were a RBBC to the MAX. Just when you thought Latavius Murray looked amazing, DeAndre Washington and Jalen Richard was take just as many if not more touches than Latavius. While Latavius is a talented RB and had superstar potential written all over him in Oakland, Jack Del Rio will look like a really horrible coach if he starts playing Washington and Richard just as much as Marshawn. While it is important to keep the BEAST healthy all season, you have to keep your BEAST happy all season. With so much of his contract based off of incentives, Marshawn on the sidelines will have all fans scratching their heads if Del Rio gets too fancy. As far as superior RB skills, Marshawn is on another level of power that DeAndre Washington and Jalen Richard cannot even begin to comprehend. As far as 3rd RB skills in catching passes, DeAndre Washington and Jalen Richard are on a level that Marshawn cannot comprehend. MARSHAWN LYNCH will be the Goal Line Back. He will be the 1st Down RB, he will be the 2nd Down RB. Whenever it is 3rd and Long or even sometimes when the Raiders are deep in their own zone. Marshawn will not be in the game. 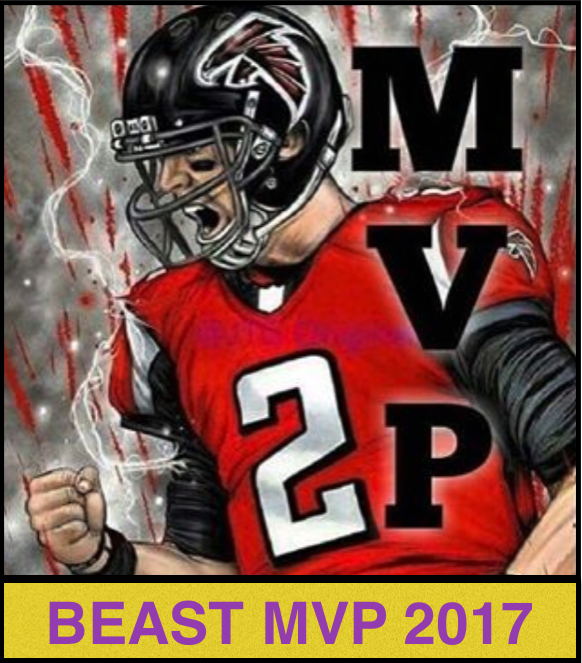 While his days of taking every snap are long gone, his days of dominating when he is the game with his 200+ Carries at over 4 Yards a Piece and all the Goal Line runs. The potential for something special is here. Especially when you consider all the Goal Line Carries Russell Wilson stole from Marshawn. Only fitting that Marshawn’s ADP status is his #24. You look at the Running Backs that go near him. The question now becomes. Do you take Marshawn Lynch in Round 2? Do you take a RB who will be part of a RBBC more or less in Oakland in Round 2? In PPR Leagues. Probably not, but potentially. As much as we love Marshawn Lynch, his PPR status is not going to be enough. Even if it is .5 Points PPR, someone like Darren Sproles and his 50 catches gives him 25 points. Then you figure 600 Total Yards from Sproles, another 60 Points. Throw in 4 TD, 24 Points. You are looking at about 110 Points. What is a lock is Marshawn rushing for 10 TD, at least. Count 60 Points right there. Marshawn should be able to rush for over 1,000 Yards. Throw in another 100 which gives you 160. Even though Lynch will have 50 more Points than Sproles based off of this very off the top of head projection. Darren Sproles is the #58 RB off the board, while Marshawn is currently the #13. There is still plenty of time for more news out of Oakland that can change this belief, but the only way it makes sense to take Marshawn Lynch in PPR Leagues is if he falls to Round 3 or later, and even that is pushing the PPR limit. In Standard Leagues. Marshawn in Round 2 is a deal you can take. 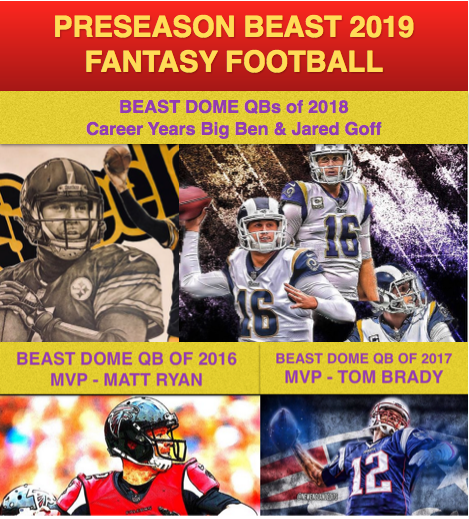 There is a lot of talent on the board in Round 2 of all Fantasy Football Drafts, however when it comes to picking a RB like Todd Gurley in Round 2, or waiting a round and seeing someone like Isaiah Crowell as the Top Sheep RB on the board. Marshawn Lynch looks very juicy.